Much as the aftermath of Hurricane Katrina highlighted ugly realities in American society, the recent earthquake has uncovered a troubling side of Japan’s national life: the vulnerability of its poor, neglected, and increasingly elderly rural countryside. You see this in the faces of tsunami and earthquake survivors on television. About one-in-three residents in the areas of Japan worst hit by the disaster are more than 65 years old, a significantly higher ratio than the national average of 22.7 percent. 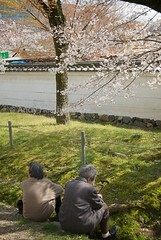 Some 22 percent of Japan’s elderly are poor, according to the Organisation for Economic Co-operation and Development. See also the excellent posting by Phil Palin, in HLSwatch on March 25, titled Learning From Japan.